American Indian Tribal Directory, The Native American Adventure. Edward S. Curtis's: The North American Indian, Northwestern University. Federally Recognized American Indian Tribes, American Indian Heritage Foundation. Indian Tribes of Oregon, The National Park Service. Native American Nations and Tribes of Arizona. Native American Tribes: 1783, University of Oregon. North Carolina Museum of History's American Indian History Time Line . Northern and Central California Indians, University of California, Berkeley. Tribal Communities, National Park Service. The Tribal Voice of the American Indian. Bruchac, Joseph: K-12 TLC Guide. Alabama-Coushatta of Texas: K-12 TLC Guide. Four Directions Institute - Coushatta Indians. North Dakota: K-12 TLC Guide. Anadarko of Texas: K-12 TLC Guide. Native Americans of Texas: K-12 TLC Guide. Apache of Texas: K-12 TLC Guide. Native Americans of Arizona: K-12 TLC Guide. Chiricahua Chief Cochise Had Courage, TheHistoryNet. Four Directions Institute - Apache. 09/04/1886: Last Major Native American Military Leader to Surrender. How Stuff Works - Apache Indians. 08/30/1880: Diablo Killed in Battle. Native American Desert People, DesertUSA. 11/29/1864: Sand Creek Massacre: K-12 TLC Guide. 10/21/1867: Medicine Lodge Treaty: K-12 TLC Guide. South Dakota: K-12 TLC Guide. Lewis and Clark Voyage of Rediscovery. South Dakota Agricultural Heritage Museum. Fort Belknap Indian Reservation: K-12 TLC Guide. Fort Peck Indian Reservation: K-12 TLC Guide. Atakapa of Texas: K-12 TLC Guide. Four Directions Institute - Atakapa. Blackfeet Indian Reservation: K-12 TLC Guide. North American Indian Days, Travel Montana. Caddo of Texas: K-12 TLC Guide. Prehistoric Caddo: K-12 TLC Guide. Four Directions Institute - Caddo. History of the Caddo Indians. The Brevard Station Museum, Stanley, NC. Catawba Project, University of North Carolina at Chapel Hill. First Nations: Issues of Consequence. Historical Highlights of North Carolina. Confederated Tribes of Umatilla Indian Reservation. Cherokee of Texas: K-12 TLC Guide. Native Americans of Arkansas: K-12 TLC Guide. Gayle, Crystal: K-12 TLC Guide. Mankiller, Wilma: K-12 TLC Guide. Maxey, Samuel: K-12 TLC Guide. Ross, John: K-12 TLC Guide. Stand Watie: K-12 TLC Guide. New Echota: K-12 TLC Guide. 1785 Treaty of Hopewell, University of Georgia. University of Tennessee - Knoxville. Biographies of the Cherokee Indians. Mr. Donn's Southeast Cherokee Indians. Official Website of the Cherokee Nation. The Cherokees vs. Andrew Jackson. A Song from the Past: The Cherokee. Trail of Tears: K-12 TLC Guide. Custer, George Armstrong: K-12 TLC Guide. Fort Laramie: K-12 TLC Guide. Fort Phil Kearny, Wyoming State Parks. 11/27/1868: Custer Leads Unprovoked Massacre of Cheyenne Village. 11/09/1875: Government Reports Cheyenne As Hostile. 11/25/1876: U.S. Troops Destroy Village in Retaliation for Little Bighorn. 01/22/1879: U.S. Troops Kill More Than 30 Cheyenne Indians Attempting to Return to Their Wyoming Homeland. 03/25/1879: Chief Little Wolf Surrenders. Little Bighorn Battlefield: K-12 TLC Guide. 1874: Capture of the German Sisters. Cheyenne Autumn: K-12 TLC Guide. 1832 Treaty of Pontotoc, Oklahoma State University. 04/28/1897: Chickasaw Tribe Gives Up Ownership of Land Promised in Oklahoma, History Channel. Chickasaw History, First Nations Histories. Chickasaw National Recreation Area, National Park Service. The Chickasaw People, The University of Tennessee at Martin. Jackson Purchase Region of Kentucky, University of Kentucky. A Sovereign (And Successful) Chickasaw Nation. Lewis and Clark's Columbia River. Lewis and Clark Bicentennial Commission. Densmore, Frances: K-12 TLC Guide. 05/12/1781: The Chippewa Sell Mackinac Island to the British, State of Michigan. 01/08/1864: President Lincoln Sends to the Senate a Treaty with the Chippewa Indians, Lincoln Log. 04/15/1864: President Lincoln Sends to the Senate a Supplemental Treaty with the Chippewa Indians, Lincoln Log. Rocky Boy Indian Reservation: K-12 TLC Guide. 04/28/1897: Choctaw Tribe Gives Up Ownership of Land Promised in Oklahoma, History Channel. 10/27/1825: 6,000 Choctaw Indians Pass through Little Rock, Arkansas, Traveling West for Resettlement. Choctaw History, Stories, and Info, University of Minnesota. Free Men of Colour & Choctaw Volunteers, U.S. Army. Mississippi Band of Choctaw Indians, Tribal Contacts. Museum of the Red River. Chumash Indian Life, Santa Barbara Museum of Natural History. The Clatsop Nehalem Confederated Tribes. The Inter Tribal Council Of Arizona. 1867 Medicine Lodge Treaty: K-12 TLC Guide. Comanche of Texas: K-12 TLC Guide. 02/19/1838: Woman Rejoins Husband After Being Held Captive by Comanches for More Than a Year. 03/19/1840: In San Antonio, Republic of Texas Soldiers Kill 30 Comanche Indians, Including 5 Women and Children. 02/26/1871: Comanches Kidnap 8 & 10-year-old Brothers Near San Antonio. 07/26/1877: The Nolan Expedition Begins an Ill-Fated Pursuit of the Last Comanches to Conduct a Raid in Texas. 05/27/1831: Frontiersman Jededish Smith Is Killed by Comanche Indians Along the Santa Fe Trail. Museum of Texas Tech University - Comanche on the Southern High Plains - Teacher's Manual. Comanche Nation: The Rise and Fall of an 'Empire'. Parker, Cynthia Ann: K-12 TLC Guide. Georgia Native Americans: K-12 TLC Guide. McIntosh, William, University of Georgia. 05/21/1733: Treaty of Savannah, University of Georgia. 1739 Treaty of Coweta Town, University of Georgia. 05/31/1783: Treaty of Augusta, University of Georgia. Creek War: K-12 TLC Guide. 01/22/1818: Treaty of Creek Agency, University of Georgia. 1821 Treaty of the Indian Spring: K-12 TLC Guide. 1825 Treaty of the Indian Springs: K-12 TLC Guide. 01/24/1826: Treaty of Washington, University of Georgia. An Introduction to the Creek Nation. Mary Musgrove, Queen of the Creeks. Creek Heritage, Ryal School, OK.
Creek Indian Cessions: 1732-1832, University of Texas Libraries. Creek Treaties with Georgia and the U.S., Carl Vision Institute of Government, University of Georgia. Muscogee: A Study of the Creek Indians. 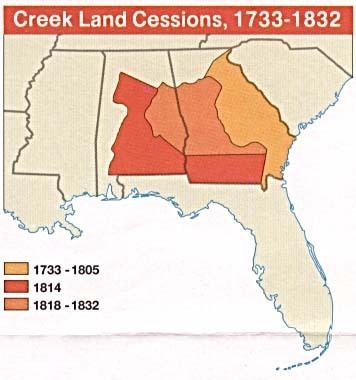 Creek and Seminole Nations Map: 1832. Muscogee (Creek) Nation of Oklahoma. Ocmulgee National Monument: K-12 TLC Guide. Tribal History, The Poarch Band of Creek Indians. 5/23/1923: Curley, Custer's Scout, Buried at Little Bighorn, History Channel. Crow Butte, Westward to Nebraska! Crow Indian Reservation: K-12 TLC Guide. Nicollet County Historical Society (pdf). 08/19: Dakota Bypass Fort Ridgely. Lakota/Nakota/Dakota, Timeline of Plains Indian Culture. Delaware of Texas: K-12 TLC Guide. Native Americans of Ohio: K-12 TLC Guide. 09/17/1778: Delaware Nation Signs First Treaty with U.S.,On-This-Day. Lewis & Clark Journey of Discovery. Powwow: The Heartbeat of a People, North Carolina Department of Cultural Resources. Gila River Indian Community, The Inter Tribal Council Of Arizona. The Civilizations Buried Beneath Us. 11/05/1653: Peace Treaty Signed with the French. Jumano of Texas: K-12 TLC Guide. Kickapoo of Texas: K-12 TLC Guide. Kiowa of Texas: K-12 TLC Guide. 07/12/1870: The Battle of the Little Wichita River. 09/17/1945: In Texas, U.S. Army Officer Paints Watercolor of Kiowa Chief Dohäsan. Kiowa Apache of Texas: K-12 TLC Guide. Flathead Indian Reservation: K-12 TLC Guide. Battle of Little Bighorn: K-12 TLC Guide. 12/21/1866: Crazy Horse Leads Ambush of 81 U.S. Soldiers. 11/09/1875: U.S. Gov't Considers Crazy Horse Hostile. 01/08/1877: Soundly Defeated in Final Battle. 09/05/1877: Crazy Horse Is Killed. Crazy Horse's Vision, Joseph Bruchac and S.D. Nelson. 11/09/1875: Followers of Sitting Bull and Crazy Horse Identified as Hostile. 05/05/1877: Sitting Bull Leads a Band of Followers into Canada Seeking Safe Haven from the U.S. Army. 12/15/1890: Sitting Bull Killed by Indian Police. Native Americans of Pennsylvania: K-12 TLC Guide. 01/31/1855: The Treaty of Neah Bay, HistoryLink. K-12 TLC Guide to North Dakota. Salt River Pima-Maricopa Indian Community. University of North Carolina Libraries. Native Americans of Wisconsin: K-12 TLC Guide. 05/21/1673: Marquette, Joliet and Five French Voyageurs Reach a Menominee Community Near Modern Marinette, Michigan. 01/13/1995: The Menominee Sue the State of Wisconsin. Indiana Native-American Heritage: K-12 TLC Guide. Ohio Native-American Heritage: K-12 TLC Guide. 10/20/1790: Harmar's Defeat, Ohio Historical Society. 11/04/1792: St. Clair's Defeat, Ohio Historical Society. 03/2/1824: Fall Creek Massacre, Conner Prairie. Little Turtle, Ohio Public Library Information Network. Misssissinewa Treaty of 1826, Kokomo-Howard County Public Library. Tribes and Villages of Florida, Tribal Contacts. Mingo Language, Carnegie Mellon University. The Miwok Indians of Yosemite, Woodland Elementary School, CA. K-12 TLC Guide to Oregon. Four Modocs Hanged for Murder of Civil War Hero. Printup, Erwin, Jr.: K-12 TLC Guide. Swamp, Jake: K-12 TLC Guide. K-12 TLC Guide to Connecticut. K-12 TLC Guide to Massachusetts. National Public Radio: 2/25/00 (audio: 21.30). 11/28/1729: Massacre at Fort Rosalie. Grand Village of the Natchez Indians, Mississippi Department of Archives and History. Cather, Willa: K-12 TLC Guide. Radmilla Cody: Two Cultures, One Voice. Native Americans in U.S. Military (audio: 8:15). A Navajo Student Feels the Tug of Home. Technology Assistance Pledged (audio: 2:12). Winds of the Navajo, Mount Washington Observatory. The Big Wander, Will Hobbs. Historical Nez Perce Archive Photography, Nezperce.com. 09/21/1904: Death of Chief Joseph. 09/26/1926: A Monument Is Dedicated at the Wallowa Lake, Oregon Burial Site of Chief Joseph. Native Americans of Washington: K-12 TLC Guide. 02/19/1858: Nisqually Chief Leschi is Hanged for Murder. 12/10/2004: Historical Court Clears Chief Leschi's Name. Occaneechi Band of the Saponi Nation. Storytelling of the North Carolina Native Americans, Ibiblio. White Earth Reservation: K-12 TLC Guide. Chouteau, Pierre, Sr.: K-12 TLC Guide. Heat-Moon, William Least: K-12 TLC Guide. Ohio Public Library Information Network. 04/20/1769: The Murder of Pontiac, Chief of the Ottawa. 09/11/1857: Mountain Meadows Massacre: K-12 TLC Guide. 10/25/1853: Paiutes Attack Railroad Survey Crew. San Juan Southern Paiute Tribe. Fort McDermitt Paiute and Shoshone Tribe. Moapa Paiute Band: Moapa Indian Reservation. Sarah Winnemucca, Library of Congress. Celebrating Nevada Indians, Native Nevada Classroom, University of Nevada, Reno. Apes, William, Massachusetts Foundation for the Humanities. "We Are Not Free", Clyde Warrior (1967), U.S. Secretary of State. Pokhagen Band of Potawatami Indians. Native Language of the Americas. 1818 Potawatomi Treaty, Ohio Historical Society. 1826 Misssissinewa Treaty, Kokomo-Howard County Public Library. Colonial Virginia: K-12 TLC Guide. Rolfe, John: K-12 TLC Guide. Association for Preservation of Virginia Antiquities. Four Faces of Pocahontas, Henrico County, VA. The Pocahontas Myth, Powhatan Nation. 05/14/1607: The Settlement of Jamestown. Prehistoric Adobe Pueblos: K-12 TLC Guide. Pueblo of Texas: K-12 TLC Guide. Crow Canyon Archaeological Center, Colorado. National Public Radio: 9/6/00 (4:15). Caddo Nation: K-12 TLC Guide. 09/12/1868: 26 S'Klallam Indians Massacre 17 Tsimshian Indians Camped on New Dungeness Spit. 06/16/1938: The 1,234 Acre S'Klallam Tribal Reservation Is Created on Washington's Port Gamble Bay. 01/26/1856: Salish Warriors Led by Chief Leschi Attack the Village of Seattle, History Link. North Carolina Indian Economic Development Initiative. Blackhawk - Rock Island, Illinois Historic Preservation Agency. Seminole of Texas: K-12 TLC Guide. Alligator Wrestlers Needed: 9/9/00 (3:00). A Seminole Warroir Cloaked in Defiance. Seminole Tribe of Florida: Official Web Site. Death Valley National Park: K-12 TLC Guide. Shoshone-Paiute Tribes of the Duck Valley Reservation. 1863 U.S. Soldier Attack: 1/29/00 (7:00). Shoshone Indians in Death Valley, GORP. 04/29/1868: Black Hills Treaty, National Archives. Black Elk: K-12 TLC Guide. Crow Butte, Westward to Nebraska!. 11/05/1862: 300 Santee Sioux Sentenced for Execution. 01/14/1891: Sioux Return to Their South Dakota Reservations. 06/22/1927: President Coolidge to be "Adopted" by a Sioux Tribe. Chief Big Foot's Hair: 9/10/00 (15:30). 09/10/00: Joe Red Cloud (8:05). 09/26/00: Is Hemp Legal Cash Crop? (4:30). 03/22/00: Land Dispute In South Dakota (3:42). The Suquamish Tribe: Home Page. Chief Seattle and Chief Joseph: From Indians to Icons, University of Washington Libraries. "Text" of the Speech, Arbor Heights Elementary School. Tawakoni of Texas: K-12 TLC Guide. K-12 TLC Guide to the Sioux. Tigua of Texas: K-12 TLC Guide. Tonkawa of Texas: K-12 TLC Guide. Southern Band Tuscarora Indian Tribe. Longtime Chief of the Waccamaw- Siouan: Priscilla Freeman Jacobs, North Carolina Museum of History. 04/01/1621: Leaders of the Plymouth Colony Make a Defensive Peace Alliance with Massasoit, Chief of the Wampanoags, History Channel. American Indians of the Pacific Northwest. Wichita of Texas: K-12 TLC Guide. 2/15/00: Yakama Impose Alcohol Tax (4:26). 4/10/00: Yakama Ban Alcohol (4:30). Yakama Indian War (Oct 5, 1855 - 1858). K-12 TLC Guide to the Kennewick Man. K-12 TLC Guide to Alaska. Yup'ik Traditions and the Kulukak Bay Fish Camp.